Leviticus 25:35 — When someone is reduced to poverty, we have an obligation to help. Ruth 2:2-23 — Boaz cares for Ruth, a widow and a foreigner, giving her far more than the law requires. Jeremiah 29:4-7 — Seek the welfare of the city, for in its welfare you will find your welfare. Luke 16:19-31 — The rich man has a responsibility to care for Lazarus. Acts 4:32-35 — There was not a needy person among them. This is the third story in a series on Catholic social teaching. Late last year, Tim Hennessy had a dilemma. President of De La Salle North Catholic High School, Hennessy was faced with a group of students wanting to block North Portland traffic over jury decisions in Missouri and New York. Panels had exonerated white police officers who had killed unarmed African American suspects. Hennessy knew his students should be allowed to exercise their right to speak out. But he also wanted them to act responsibly. He asked them to think things over for a few days. When the students returned, they said that dialogue with people in power would have a better effect than impeding cars. The youths invited Portland’s mayor, police chief and the retired chief justice of the Oregon Supreme Court to a forum held last month. 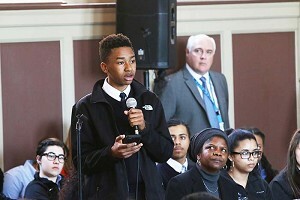 Students spoke their mind and listened respectfully. One senior has since gotten an internship in the city to work on community policing and race relations. “That was a huge lesson for them, for all of us,” Hennessy says. “They not only have the right, but the responsibility to speak for everyone in the community.” Next year, students plan a forum on immigration. According to Catholic tradition, human dignity can be protected and healthy community achieved only if human rights are guarded and responsibilities are met. Catholic schools are a major source of teaching on rights and responsibilities. At De La Salle North Catholic, longtime teacher Edward Zupcic leads the Constitution team and discusses with students how how they have a responsibility to learn their rights and protect them. In Catholic ministries like Blanchet House in Northwest Portland, rights and responsibilities are the stuff of everyday life. The longtime ministry offers meals to homeless and low-income people and provides alcohol- and drug-free housing for men trying to beat addiction. Everyone has a right to food and shelter, and society is obliged to provide it, says Greg Baker, executive director of Blanchet House. Diners and residents at Blanchet also have responsibilities: No fighting. Attend 12 Step groups. See your case manager. On top of the list — no drinking and no drug use. When men come to live at Blanchet, they write up a plan for their lives and sign it. When they go off the rails, counselors pull the plans out and talk straight. The Metropolitan Alliance for Common Good seeks to protect rights for those on the margins in the Portland area. The church-led group knows that responsibilities need to be paired with rights, says Mary Nemmers, lead organizer and a member of St. Andrew Parish in Portland. For example, MACG was a major supporter of a failed ballot measure that would have allowed undocumented immigrants drivers’ cards. Though the new law would have extended rights, it also required the new drivers to be responsible and pass a driver’s test. Now, the organization is hoping to pass a statute in Portland that would change local employment applications, nixing the box that asks about criminal convictions. That question can come later in the process, after applicants have proven their value, says Nemmers, explaining that this is a rights-responsibility issue, too.